In 1994 I had the privilege and honour to organise a music concert: MUSIC BACK TO SIXTIES, dubbed The Hot Show, which featured 25 Uganda’s legendary musicians and dancers including among others: Swisseman Ngoy, Fred Masagazi, Freda Sonko, Christopher Sebadduka, Margaret Nakibuuka, Christopher Kato (the dance wizard) and his youthful dancing partner Night Flower Namusisi, Andrew Kyambadde, Kamparo, Hadijah Namale, Mary Nattima, Louise Bagenda, Simon Berunga etc. The show was sponsored by Kampala Bottlers and hosted by the Sheraton Kampala Hotel. Kampala Bottlers was owned by Amos Agaba, now deceased, a true music promoter who owned Waka Waka Band led by Amigo Wawawa aka Wakusimbi ow’Effumbe. He put it at our disposal for the entire duration of the month long rigorous rehearsals and show. During our interview for the show catalogue, Mzee Swisseman told me he was born in 1939 in then Congo Leopoldville later renamed Zaire. He was married and had children one of them Ola went on to become the first Miss Uganda, when the beauty pageant was revived in the 1990s. He started dancing in 1954, and the first band he joined was Mario Jazz based in the then Zaire Republic now renamed Democratic Republic of Congo. As a vocalist his first song was “Janine”. Asked what his favourite song was, Swisseman named two, “Omusujja” sung by carol Nakimera of Super Rocket Band of, which he was the manager and “Muziki Ya Mboka” by the Vipers Band led by Raphael Kawumba. Coincidentally the two were equally some of my favourite songs. His favourite vocalist and dancer was Arlus Mabele, while the musician he admired most was Luambo Luanzo Makiadi aka Franco of the “Mario” fame by OK Jazz Band. He will be remembered for introducing and popularising Congolese aka Zairean contemporary dances in Kampala in the 1960s and 1970s at New Life Night Club aka Ewa Kamulu e Mengo, where Sir Apollo Kagwa Primary School is located today. New Life Night Club was later renamed Economic Night Club after the expulsion of Asians in 1972, who since the arrival of the British colonialists had dominated Uganda’s commerce and trade. Among the dances he introduced, while in the Vipers Band then was: Soukous, Kiri Kiri, Toyota, Yeke Yeke, Apollo 11, Embalasasa etc. Although Suisseman was a vocalist and dancer it was his dancing skills that earned him a lot of fame and endeared him to teenagers especially at the height of teenagers’ dances era in 1968,69,70,71,72, 73. The Scotch whisky brand VAT 69, was cheekily interpreted as Very Active Teenager in 1969. The daytime dances subsequently banned by government, mbu for spoiling youngsters. Unfortunately the folly of it was that, youngsters ended up sneaking into night clubs after bribing gatekeepers with favours both in cash and kind. They weren’t only spoilt but morally wasted and we are still paying the price todate. UTV the then only television station in Uganda (owned and run by government) did a lot to promote Suisseman. They would invite him to perform in their studios, and air the shows every weekend. He was a sharp dresser, flamboyant and instantly recognisable because of his height and dress style. Most of the time he would be seen in bell bottom trousers, slim-fit silky shirts with broad collars, scarfs, sombreros and stiletto shoes, waving to cheering and adoring crowds on Kampala road especially on Saturday mornings. He was fashion icon and trendsetter. For trendy teenagers Kampala road was the place to be every Saturday morning. They woukd walk the entire street between Bombo road and Jinja road before boarding UTC buses in the afternoon and head straight to White Nile in Katwe and New Life in Mengo to get down on it. Many teenagers after watching him perform on UTV with agility and fluidity were tempted to go to where he performed with his band, to get a real-life experience. Especially for those in Kampala and environs. Unfortunately the under 18s by law were not permitted to enter night clubs at night. Those upcountry settled for the silver screen. Many a teenager emulated his dancing and dress styles, including yours truly. I would later introduce the same in Nairobi in 1971, where we performed with the late Henry Dede Majoro, the legendary talented instrumentalist. Dede was the Kawumba and yours truly the Suisseman of some sorts. From then on Congolese/Zairois music took root and was later to become increasingly popular and by the end of the 1979, it had become the music of choice. Thanks to resident Congolese/Zairois bands: Le Noir, Le Kenoir, Baba Gastro, Les Wanyika, Mangelepa, Virunga and occasional visits by Congolese music Maestros such as Luambo Luanzo Makiadi aka Franco, Tabuley, Sam Manguana etc. The situation was redeemed when teenagers’ dances were introduced. They would start at 2 pm pm and end at 7 pm. New Life Club was the place to be every weekend in the afternoon for teenagers and at night for the grown-ups including some rebellious teenagers. 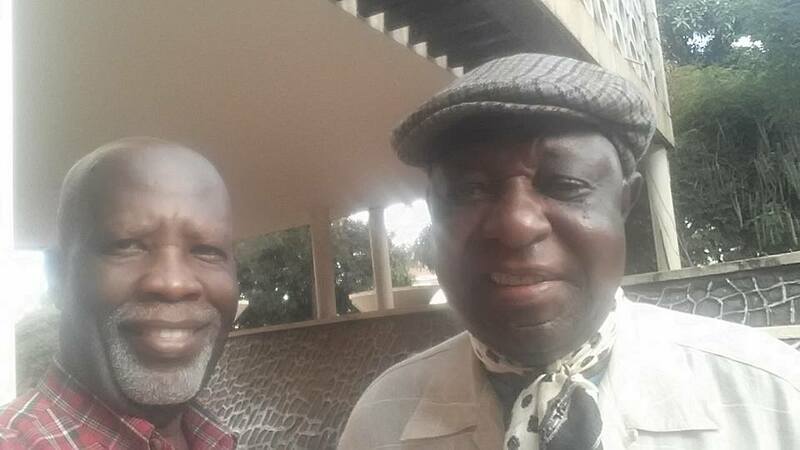 Mzee Suisseman Ngoy’s name is permanently etched in the history of Uganda’s music and dance. May the Almighty God grant the family, fellow artistes and friends the grace to deal with the loss. May Suisseman’s legacy be the source of inspiration for the betterment of the creative industry at a time when the industry is encountering serious challenges. 31. What then shall we say to these things? If God is for us, who can be against us? 32. He who did not spare His own Son, but delivered Him up for us all, how shall He not with Him also freely give us all things? 33. Who shall bring a charge against God’s elect? It is God who justifies. 34. Who is he who condemns? It is Christ who died, and furthermore is also risen, who is even at the right hand of God, who also makes intercession for us. The difference between last year and next year is this year. And it is within your means. So stop stressing yourself by worrying about how and whether you will make it happily into next year or not. Believe me or not your worrying won’t delay the arrival of next year nor will it speed up this year. Just the way last year passed and this year came so will this year end and next come. Therefore do everything you can within your means to be happy as you make others happy too. But their happiness should not be at the expense of yours. Don’t make any more resolutions basing on the Gregorian calendar year. But make short term cumulative and achievable resolutions so that at the end of next year you will surely look back at your accomplishments and marvel at how much you were able to achieve. The danger with annual Gregorian calendar based resolutions, they make you an under achiever. You wait until the last quarter of the year and start running around in an effort to fulfill your so-called new year resolutions. And when you do, you go around chest thumping mbu you met your new year resolution. Yet you are a mere underachiever who accomplished a mere quarter of your annual capability. Meanwhile, l wish you a fruitful new year that is full of blessings. Today a couple came into my studio/gallery looking for wedding presents to give to their son and his fiance who are due to wed tomorrow. Among the presents was one particular mat, which unfortunately had its binding undone. While in normal circumstances I would suggest an alternative, they seemed hooked on to this particular one. Usually I contact the mat makers, who come and do the needful. Since there was no time I decided to offer a design solution. I looked at the binding, studied it and decided to mend it using the available tools and materials, which seemed inadequate but I managed to improvise successfully. It was my first time to mend a mat, and thanks to my mother who introduced me to the skills of sewing and tailoring during my childhood. While my mother was a qualified teacher, nurse and midwife and actually gainfully employed she also owned a sewing machine which she used to make her clothes and ours too . These skills would come in handy later when I joined the armed forces, where you were required to solve all sorts of problems as they arise. Some anticipated and others totally unexpected, but you were expected to find and offer a solution especially before appearing at the muster parade, where you were expected to turn up in tip top form and smartly dressed to avoid being punished. Some of the punishments would involve being ordered to take cover and roll next to a pool of muddy water if the instructor felt you were not smart enough. This would happen most often early in the morning. After that you were expected to go to the dormitory, clean up and report back immediately. Otherwise you would be charged with being absent without authorised leave (AWOL). So as we close the year I am pleased to report that I have a newly acquired skill on top of the many God endowed me with. Did I mention that a couple of weeks ago I held an exhibition to mark 40 years of art practice? Well now you know. Glory be to God the Most High as we inch towards 2019. My art is an expression of my inner feelings, an interpretation of my experiences and those of others. It is a celebration of the talent bestowed upon me by the grace of God because I did not attend a formal art school. It is informed and inspired by my cultural heritage and the vast experience I have gained through extensive travel around the world. Below is a poem I composed in 1997 in Atlanta, Georgia, USA, on the eve of my art exhibit to mark the Grand opening of Gems Of Africa Fine Art & Sculpture Gallery . I intended to address the frequently asked question about me and my art and how long it takes me to complete a work of art. An Authentic visit from the Sand artist. 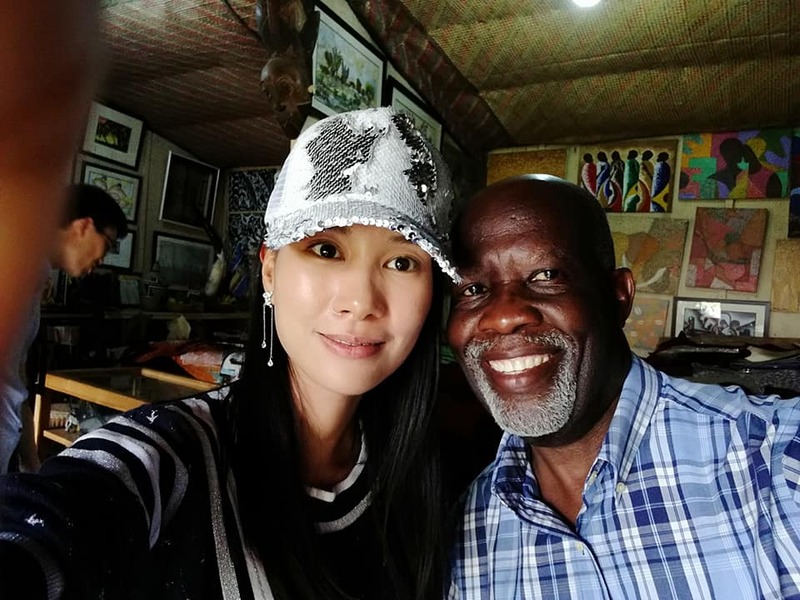 On Friday, December 21st, 2018, Sand artist Lusa and her countrymen from China came to Nnyanzi Art Studio. Among the art pieces that touched her heart was ‘Single Working Girl’ that graces the cover of 1998 WHO Report. Another piece ‘The personification Of The Rotary Family’ was equally appreciated by those who came with her. This evening I went to the republic in Kamwokya to check on my grand niece Ruksy who has lost her beloved mother-in-law, which necessitated her husband Sachin to rush to India to arrange for her cremation as per the Hindu custom. On my way back, Ruksy showed me the famed Fire Base studios. Although I have on so many occasions passed by that place and I was aware through the media that Fire Base the headquarters of the ghetto republic was located somewhere around Kamwokya. In other words this is the place where HE Bobi Wine does what he does best; compose, sing, record and produce music that has made him a factor not only in social commentary but also an earthmoving political actor of a global stature. 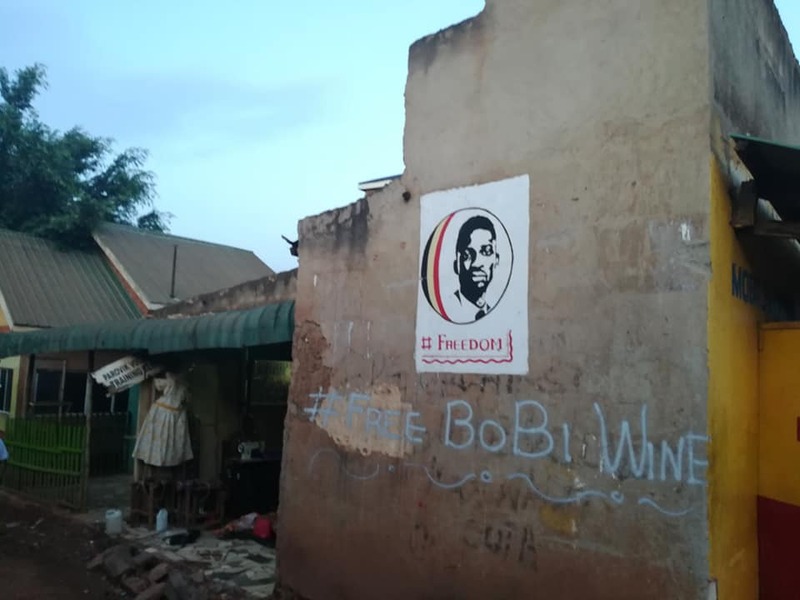 The walls that probably which appear to have not been painted for a while, are host to some imposing graphically drawn portraits of HE Bobi Wine aka Hon Robert Kyagulanyi, the member of parliament of Kyaddondo East. Below the portraits are captions demanding his release. It is here where the studios that birthed the now famous Kyarenga hit are situated. KYARENGA is a song that leaves nobody unmoved regardless of one’s political affiliation, social standing, economic status or even religious beliefs. I decided to walk to Bukoto where I live as I reflected on a place that is increasingly becoming of historic importance as far as Uganda’s politics is concerned. Memories of 1972 came back rushing to my mind as I walked. It was around Kamwokya that my colleagues and I had spent our last evening out in Kampala before exiting to various units we had been hastily transferred to. It was an order from the then Commander in Chief to the then Chief Medical Officer Col Dr Gideon Bogera, to disband a unit that had been recruited, undergone basic military training and was waiting to be sent for medical training abroad. It was at a popular bar called Africana, where we revelled and that last night in Kampala, I still recall to date the number that was played over and over again on the juke box. ‘Jamaica Farewell’ by Harry Belafonte. The only difference was in Belafonte’s song he was leaving on a jet plane while we were to leave on buses. I was to lead the team that was posted to the 2nd Battalion aka Gonda based in Moroto. 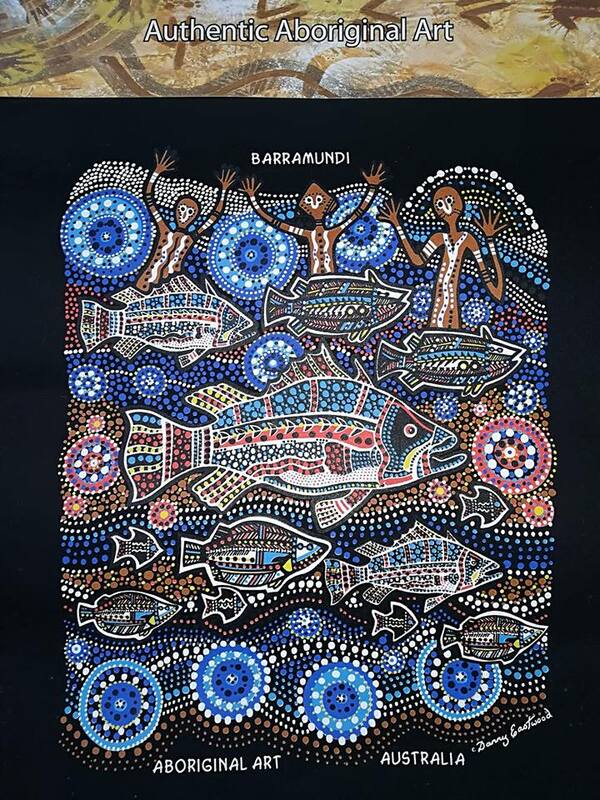 Am now a proud owner of an Aboriginal art piece, courtesy of the generosity of Night one of my patrons. She promised to get me one a couple of years ago, when she brought in hers to be framed. That was my first time to come face to face with Aboriginal art. It kinda of looked like some of my art pieces in Black and white as well as the ones in pointillism. I insist culture/creative industry in Uganda create more jobs, contribute more to the national economy and positive image of the country than any other industry! Yet gets little support if at all from the national treasury! Let whoever disagrees provide empirical data to the contrary. Otherwise rust in pieces. Happy 92nd birthday Your Eminence Emmanuel Cardinal Wamala. May God continue to bless you with good health. 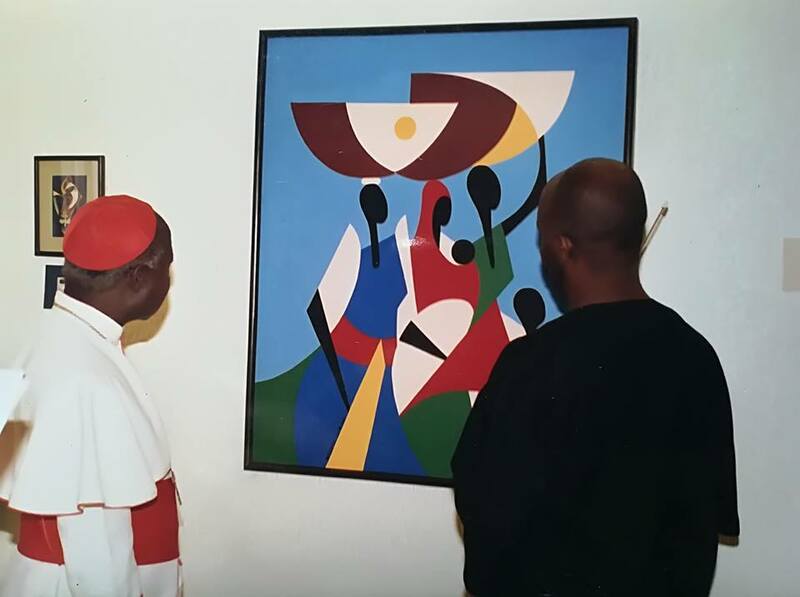 In this pic the Cardinal was captured admiring one of my art pieces ‘MOTHERING THE NATION’ in 1998 at my art exhibition to mark the 10th anniversary of Sheraton Kampala Hotel, Uganda.